This tiny praying mantis was hanging out on the table outside at our friend’s house. To ensure his longevity I decided to move him to a safer place in the trees. When I put my hand out he happily walked on and of course photos had to be taken (which weren't entirely easy with only one hand available!). I was blown away with his amazing movements which were also rather entertaining. He started on a walk up my arm, stopping for a quick prayer then some crazy head twisting. I’m pretty sure it turned 180° for cleaning (I think) or maybe he just enjoy contorting his body! In one photo he is barely recognisable as a praying mantis. When I went to put him on a tree he wasn't terribly happy to go. After I had encouraged him to get on the plant he stretched out towards me almost like he didn’t want me to go. So I put my hand out again and what do you know he leapt back onto me. I had a new friend! 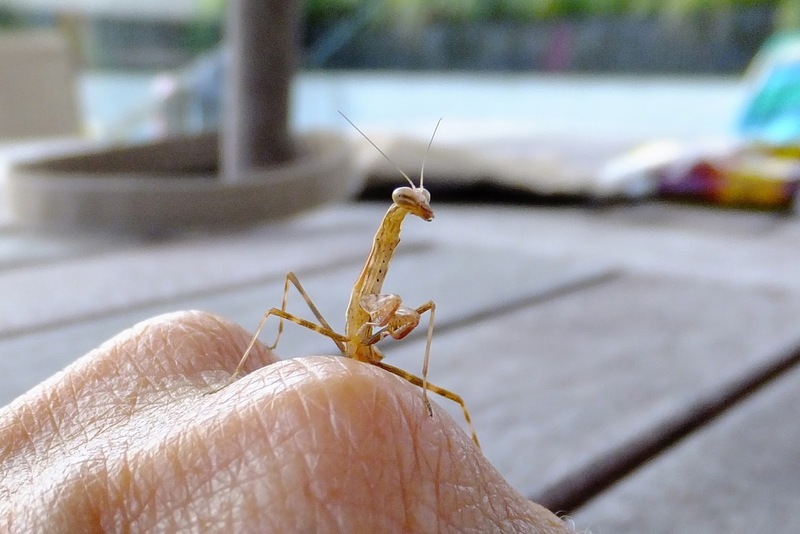 And I found out that praying mantis can jump. Eventually I had to socialise with humans so found another tree and encouraged him to alight again then wished him a fond farewell. Feeling uplifted by the experience.